My recent trip to Cuba was so inspiring. From the architecture of the weathered buildings to the brightly colored classic cars it’s like stepping back into time. You can just imagine being there many years ago when Havana was one of the finest cities in Latin America. Havana is one of the most architecturally diverse cities in the world thus one of the most dreamy for an interior designer. Havana’s political history has given way to its diverse architecture. Not only will you find amazing buildings from the Colonial and Baroque period there is also a strong Spanish and Moorish influence. At the beginning of the 19th century Neo-classical made an appearance followed by Art Nouveau and Art Deco in the 20th Century. The Cathedral of the Virgin Mary of the Immaculate Conception located in the Plaza de la Catedral in the center of Old Havana. The church is considered one of the best examples of Baroque Architecture in Cuba. 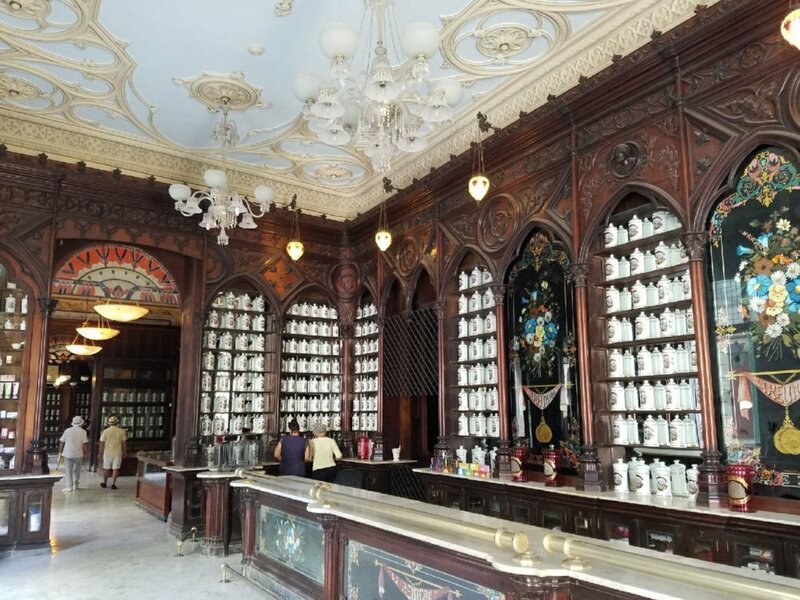 Historic Taquechel Pharmacy restored in 1996 has been dispensing herbal remedies for more than a century. The architectural detail on this building I found striking. Look at that Greek key fretwork! How amazing are the curves on this Art Nouveau door. During the early 20th century and the beginning of the Art Nouveau and Art Deco period Havana expanded quickly. The city quickly began enforcing regulations on all details of new construction. Architects were required to submit all plans for approval to ensure that a house was aesthetically agreeable within a particular neighborhood. Do you love color? Then Check back soon for Part 2 of my trip to Cuba where I discuss all things color.Don’t forget to like us on Facebook and follow us on Instagram!